Have questions? Click here to visit our Frequently Asked Questions page! ...transforming Timeless Images into Heirloom Works of Art. Important Note: The studio is currently accepting advance reservations for 2-3 months in advance. If you are due any day or have just had your baby, you are welcome to call us for the possibility of any last minute "squeeze-in" sessions or to request to be put on the waiting list. If you are pregnant in your 1st or 2nd trimester, please contact the studio today so you do not miss the opportunity to capture the beauty of your baby bump and your newborn baby. If you are interested in newborn portraits only... we still strongly suggest scheduling your session at least two months prior to your delivery date to be assured of availability. 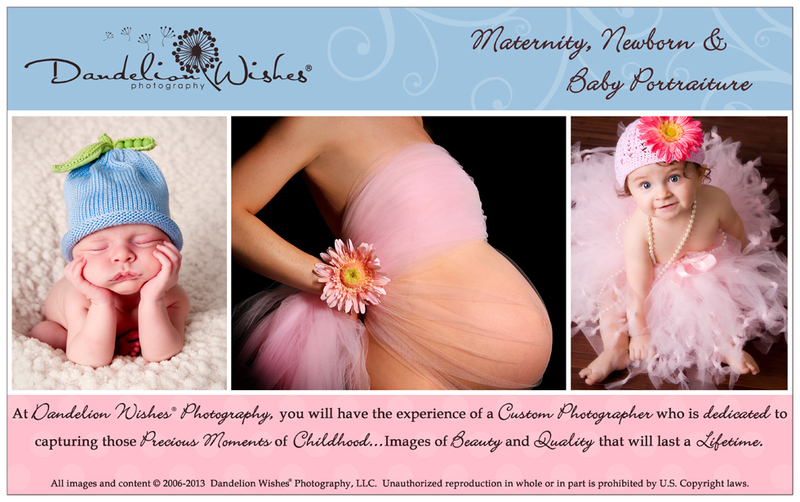 Known for creating Fine Art Photography of your maternity, newborn or baby; Northern VA portrait photographer, Dawn M. Miller, believes that Artistic Photography will be cherished by your family today and, is an investment for future generations. Specializing in photographing newborns, babies and maternity, her clients include people from all walks of life including some of area's top leaders in law, business, medicine, education and military as well as professional athletes. Dawn approaches each session with an artistic eye, ample patience and an added touch of humor to make it fun. Not to be confused with typical portrait photography studios, Dawn delivers an upscale, customized experience not found anywhere else. Preferring to work in her studio, she manipulates light to create stunning photographic works of art that are unique and full of emotion. Whether you choose rich color or classic black and white, you are assured of beautiful, meaningful portraits. Working with babies is a joy! Between 6 â€“ 8 months of age is a wonderful age to create portraits that reflect the spirit and playfulness of your baby. Clients very often will say "you really captured his look perfectly" or "that is so her"! Dawn works diligently to get those expressions that mom and dad are so familiar with. Moms and Dads all over the Northern Virginia, Maryland and the greater Washington DC area are encouraged to have baby's portraits done during this age range, especially if they missed having newborn portraits done. Parents choose Dandelion Wishes® Photography because they know they'll receive portraits that are the best in baby photography - it's "your baby as art" ™. Dandelion Wishes® Photography is an upscale, full service portrait photography studio offering more than just artistic images of your child. Select from finely framed wall art or a spectacular gallery wrap canvas to luxurious leather albums or exquisite fine art portrait books. To complete your session experience you'll also enjoy "The Boutique Collection". There you'll find a full array of upscale, personalized items to showcase your portraits as well as custom designed and printed Baby Photo Birth Announcements and more. Convenient to Northern Virginia, No.VA, Richmond VA, Alexandria, Arlington, Fairfax, Mclean, Vienna, Tysons Corner, Reston, Fair Oaks, Centreville, Warrenton, Manassas, Gainesville, Ashburn, Leesburg, Charlottesville, Winchester VA and suburban MD. Portrait art clients come from all over the greater Washington DC metro area. The professional portrait studio is located in Warrenton, Virginia with easy access from Fauquier County, Prince William County, Loudoun County, Fairfax County, and Culpeper County, VA.
Dandelion Wishes® Photography, LLC is a Preferred Virginia Photographer at 411marketsource. Dandelion Wishes® Photography, LLC is a premier vendor in the Warrenton, Virginia Photographer showcase on SnapToIt.com. BabyPortraitPhotographers.com is a directory of the top baby photographers & best new born photography studios in the world. Click on the link below to find a Baby Photographer in your area. After visiting our Studio, why not take some time to get to know Warrenton, Virginia? There are quaint shops in Old Town Warrenton as well as lots of great restaurants and shopping! Click the photo link below to find out more about our beautiful Fauquier County!